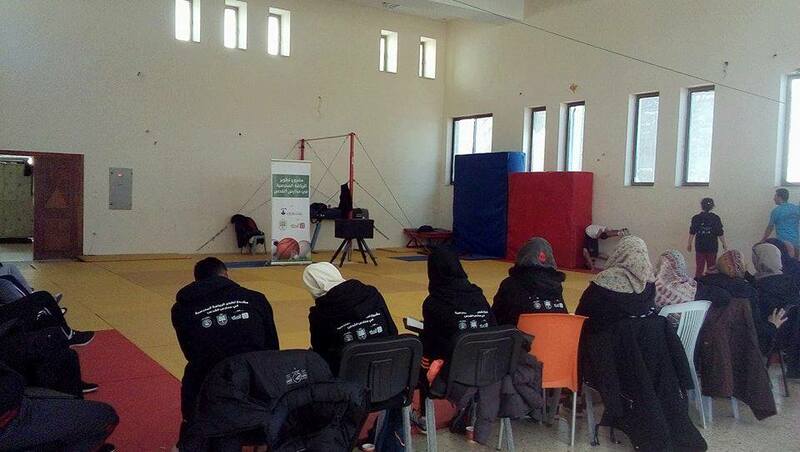 Burj Al-Luqluq Social Center Society organized, within the Schools Sports Empowerment project, a special training course in gymnastic for the physical education teachers at the schools of the ministry of education and Higher Education in cooperation with the Directorate of Education and the Palestinian Gymnastic Union, under the supervision of the Welfare Association and funded by the Arab Fund for Economic and Social Development. 38 male and physical education teacher from the schools of the Ministry of Education attended the training for 3 days from the 26th to 28th December 2017 at Al-Quds University. Burj AL-Luqluq Executive Manager Muntaser Edkaidek confirmed that the project aimed to target 27 beneficiaries while 37 beneficiaries participated in the training including10 teachers from the private schools of the Directorate of Education as they are interested in empowering their teachers in addition to the level of their sport sessions.